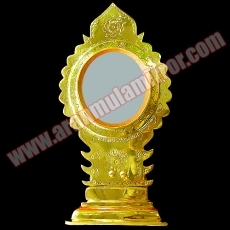 This mirror is known as Lakshmi Mirror, it believes that keeping this mirror will bring you greater prosperity and wealth The intricate art work on the high quality brass is an epitome of craftsmanship. It has a mirror stand which could be detached. The stand by itself is a statement of art. . It is usually presented as gifts on occasions like marriages, house warming, inauguration and the like.